James Horner. What you expect to get is almost always exactly what you will end up getting. To be honest, the composers' music rarely surprises the listener. New, inventive and original ideas are rare. At least for the last couple of years. 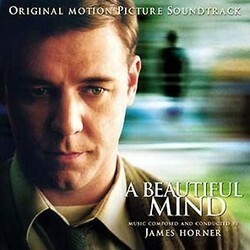 The score for Ron Howards' latest film, A Beautiful Mind, is no exception. Horner has without doubt found a sound he is satisfied and comfortable with and he does his thing and he generally does it well. A Beautiful Mind is a fine score, but the fact that you often can guess the next note, or even the next phrase, is somewhat distracting. Sometimes it's even extremely distracting and rather annoying. Basically, A Beautiful Mind is Jimmy on autopilot. It's as if Horner pushed a button, leaned back with a cup of coffee, played around a little with all the strange gadgets, toys and models in his studio and a couple of weeks later the score for A Beautiful Mind was ready, without too much sweat, blood or tears. And there's really nothing wrong with that. His most recent scores (and with that I mean his scores from around 1999 to today) almost always work - both on CD and in the film (his score for Enemy at the Gates is one exception, though. Rather good on CD, but quite horrible in the film, actually) but I really miss the composer who penned the wonderful scores for Braveheart, Apollo 13, Glory and The Spitfire Grill etc. If anyone knows where he is tell him I'm looking for him. A Beautiful Mind is far from original. We all know Horner has his own four note danger motif (no, it's luckily not used in A Beautiful Mind at all), but I am starting to realize that Horner also has a motif, or rather a sound, that he uses to represent technology, mathematics and to let us know that this or that person is currently doing something that requires a great mind. A beautiful mind. I'm talking about the upbeat piano riff heard for the first time in Sneakers, developed further in Searching for Bobby Fischer and used in the Main Title cue in Bicentennial Man. It's used in A Beautiful Mind as well. In fact, large parts of the score is based on it. However, this time Horner adds the voice of soprano Charlotte Church to the mix. I think this music works really well, despite the fact that it is so familiar, but it would have worked even better without Church's contribution, as I don't think it adds anything interesting or memorable to the musical palette. I just don't like the way her voice is used here. A Horner score where female vocals really work is Titanic. Sissel's soft voice is one of the reasons that score is so great. But A Beautiful Mind... well, I just don't like the way those parts sound. However, the song "All Love Can Be", written by James Horner and Will Jennings, and performed by Church is actually quite nice. It's much more intimate and classical sounding than the bombastic Celine Dion ballads we usually get. But when it comes to Charlotte Churchs' singing in the actual score, I think Horner made a mistake. But the largest problem with A Beautiful Mind is not Charlotte Church but the thematic material. We get two themes. The first is slow, simple and really bland and you will probably miss it if you don't pay attention. The second is really beautiful. It's a typical, bittersweet, Horner theme, but the fact that it's so underused and rarely heard makes it somewhat of a disappointment. The score is actually rather themeless. It might sound boring, but the A Beautiful Mind is a score that is relaxing, intimate and beautiful. Think Bicentennial Man, but leave out the lush, thick strings, the big crescendos and the sweeping themes. I suppose it must sound like I really dislike this score. I don't. 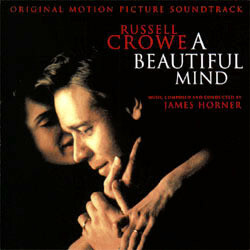 It's a good score, but compared to all the great scores by James Horner out there, A Beautiful Mind is rather weak and bland. While James Horner hasn't scored all of Ron Howard's films, he does seem to end up scoring almost all of Howard's best ones, from the early days of Cocoon to the superb docu-drama of Apollo 13. With A Beautiful Mind we have yet more proof that Russell Crowe is a major acting force and not just a new square jawed action hero - he can leave that to Ben Affleck and chums. The true story of John Nash has been reasonably well received although the cynical have suggested it's just Howard trying to nab his first Oscar. Howard isn't by any means a bad director, but there isn't much to suggest he's an exceptional one, but we'll find out on Oscar night what the Academy thinks. The nomination for James Horner's score was something of a shoe in, although since I doubt it reached the audience and Academy voters like Titanic did, the odds of another win are frankly slim. In any event, on purely musical terms it's probably the least interesting of the candidates with a moderately successful mixture of the opening cue from Bicentennial Man and the eerie vocals of Sneakers. While it adds almost nothing new - the harmonies are almost the same and the melodies with only negligible differences - the clockwork rhythms against the vocals sum up the maths and the man in music very effectively. Unlike the usual nameless vocalist (discounting Sissel's work on Titanic), Horner has here employed Charlotte Church whose delivery is perhaps a little intense for the featherlight, graceful sound that was conjured up for Sneakers. The orchestral sections are fairly standard Horner ebb and flow of strings, piano and woodwinds which is pleasant, but provides little variety - save for yet another brief Gayenne snippet for a more suspenseful mood. All Love Can Be, performed again by Church is another none too inspired Horner and Will Jennings ballad, which continues the trend of having less and less interesting melodies. The score does manage to avoid being too sentimental and cloying, Horner keeping the orchestrations simple and the harmony with an undercurrent of melancholy which seems quite fitting. Still, it's hardly a great achievement and adds weight to my feeling that Horner hasn't come up with anything new or special since The Mask of Zorro. Horner does have the ability to paint broad, but well placed musical strokes, I just wish he'd find a new way of doing it.